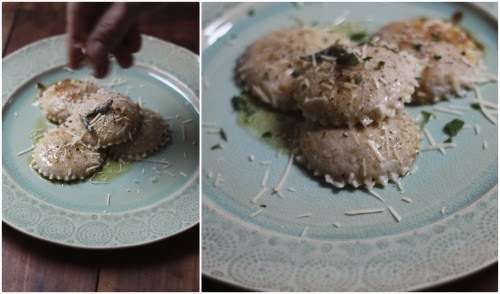 You might remember, several weeks ago I pulled out my grandmother's pasta and bread board and quite honestly struggled with trying to document making a butternut squash ravioli from scratch. The pictures of the process turned out well in my opinion, but I believe I still have flour behind my ears! Those raviolis went directly in the freezer for a meal and post on a later date — and you guessed it, that day is today! 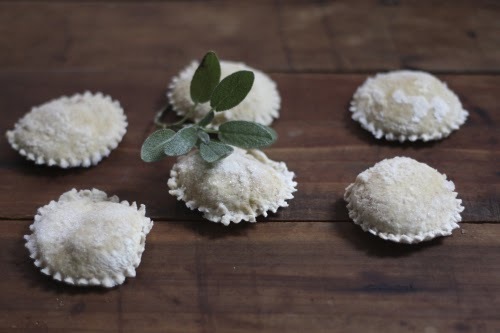 Once your raviolis are made (see process and recipe here), boil them in a pot of water. Careful to stir on occasion to keep them separated. Typically, your raviolis are done once they float to the top of the boiling water, 4-5 minutes. Remove and add salt, pepper and plate. 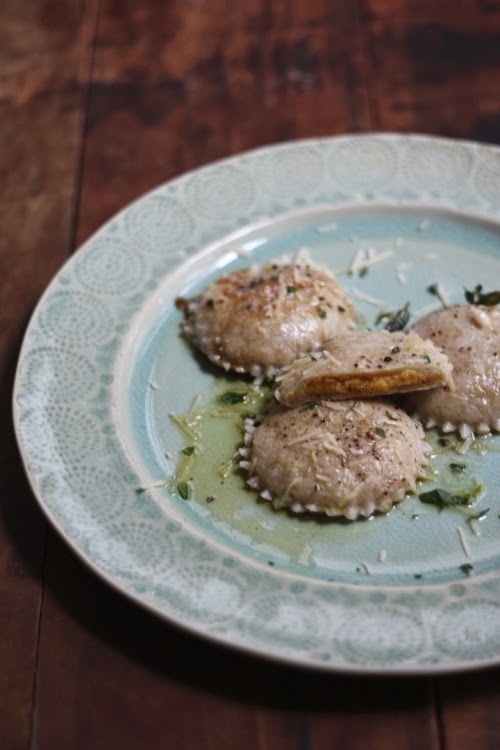 While your ravioli is cooking, simply melt 6 tablespoons of butter with 6-7 sage leaves in a saucepan. Keep an eye on your butter and just at the point it starts to turn brown, remove it from the heat — there is a really fine line here and it can go from brown to burnt almost instantly! 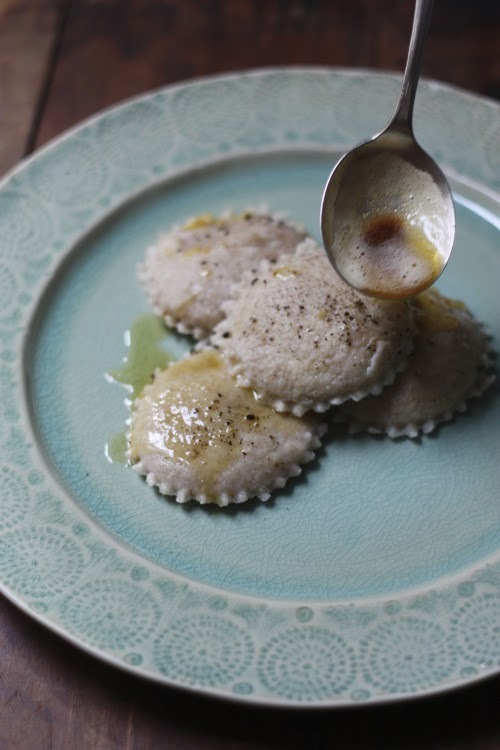 Spoon the sage brown butter over the cooked raviolis. Dress with fresh grated parmesan, a rough chop of parsley and a couple of those crispy sage leaves from the pan for garnish. Serve immediately. This was my first attempt at homemade ravioli and I have to say I was pretty proud of the outcome. The butternut filling was sweet yet savory, perfect for fall and winter warm dishes. 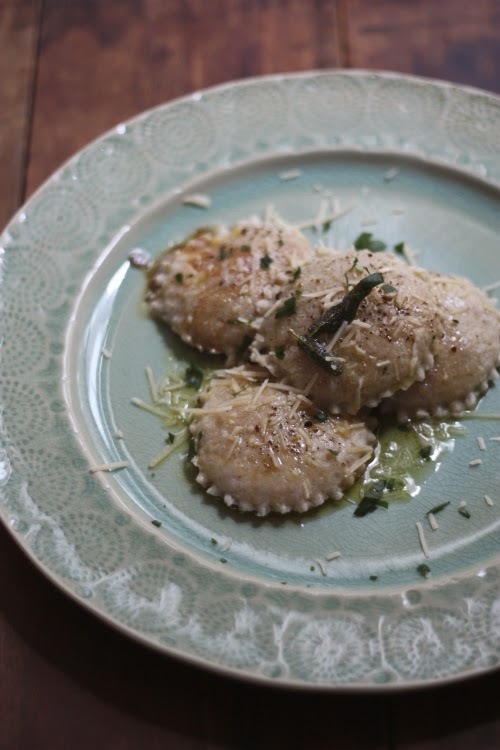 Making the ravioli ahead of time makes for a simple and easy weeknight meal. Butternut squash is certainly in season so pick some up and give this a go!